The majority of the components that make up your garage door system are fairly simple in themselves - mostly mechanical or fairly basic electrical parts. The opener, however, is a highly complex self-contained unit. Not only does it enable the automatic movement of your door, it also houses the remote control system and most of the door’s safety features as well. Like any complicated machine there are plenty of things that can go wrong, though, so when you run into problems it’s best to contact our team of highly experienced technicians. Whether your opener’s circuit board has a glitch, the safety sensors need to be aligned, or the drive gear requires lubrication, our technicians can provide a speedy and effective solution for your problem. With more than a decade of experience working in the industry, our team has a wide range of skills which allows them to quickly diagnose and address any problem, from faulty wiring to dented trolleys, and more. Your door’s opener must be regularly tested to ensure it’s working properly. Our technicians will make sure that all moving parts are properly lubricated to ensure smooth operation, that the safety sensors are correctly aligned, and that the door’s other safety systems are functioning correctly. It’s crucial to arrange regular professionally conducted inspections so that potentially dangerous problems can be caught early. As well as maintaining and repairing your opener, our team can also install a new unit for you. 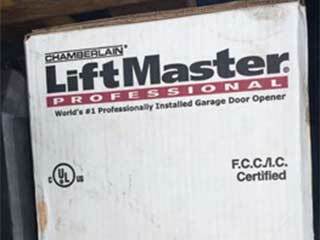 We work with major manufacturers like Chamberlain, LiftMaster and Genie to bring you the best the industry has to offer. Our team offers expert guidance every step of the way, as well as top-tier installation services and thorough testing. For opener repairs that you can count on, contact Garage Door Repair Merrick today. We’re always on hand to provide a fast, effective solution - just get in touch to arrange an appointment!